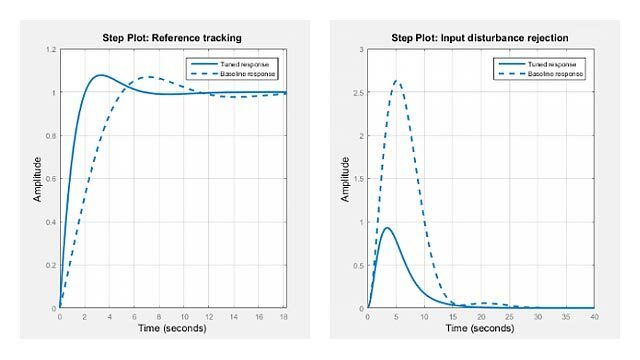 This case study illustrates Kalman filter design and simulation. Both steady-state and time-varying Kalman filters are considered. The following matrices represent the dynamics of the plant. The equations of the steady-state Kalman filter for this problem are given as follows. xˆ[n|n-1] is the estimate of x[n], given past measurements up to yv[n-1]. xˆ[n|n] is the updated estimate based on the last measurement yv[n]. This filter generates an optimal estimate yˆ[n|n] of yn. Note that the filter state is xˆ[n|n-1]. Here, the first expression is the state equation, and the second is the measurement equation. The following command specifies this plant model. The sample time is set to -1, to mark the model as discrete without specifying a sample time. Assuming that Q = R = 1, design the discrete Kalman filter. This command returns a state-space model kalmf of the filter, as well as the innovation gain M.
The inputs of kalmf are u and yv, and. The outputs are the plant output and the state estimates, ye=yˆ[n|n] and xˆ[n|n]. Because you are interested in the output estimate ye, select the first output of kalmf and discard the rest. To see how the filter works, generate some input data and random noise and compare the filtered response ye with the true response y. You can either generate each response separately, or generate both together. To simulate each response separately, use lsim with the plant alone first, and then with the plant and filter hooked up together. The joint simulation alternative is detailed next. The block diagram below shows how to generate both true and filtered outputs. You can construct a state-space model of this block diagram with the functions parallel and feedback. First build a complete plant model with u, w, v as inputs, and y and yv (measurements) as outputs. Then use parallel to form the parallel connection of the following illustration. Finally, close the sensor loop by connecting the plant output yv to filter input yv with positive feedback. The resulting simulation model has w, v, u as inputs, and y and ye as outputs. View the InputName and OutputName properties to verify. You are now ready to simulate the filter behavior. Generate a sinusoidal input u and process and measurement noise vectors w and v.
Compare the true and filtered responses graphically. 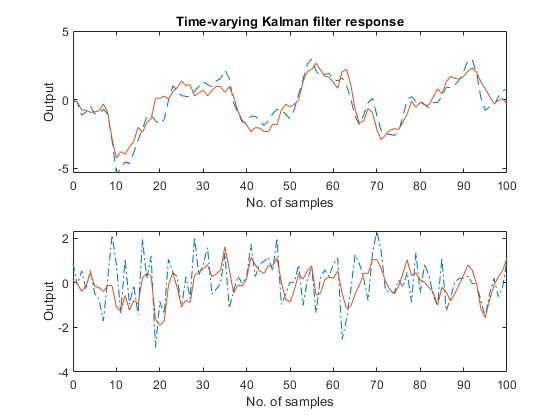 The time-varying Kalman filter is a generalization of the steady-state filter for time-varying systems or LTI systems with nonstationary noise covariance. Consider the following plant state and measurement equations. For simplicity, the subscripts indicating the time dependence of the state-space matrices have been dropped. Given initial conditions x[1|0] and P[1|0], you can iterate these equations to perform the filtering. You must update both the state estimates x[n|.] and error covariance matrices P[n|.] at each time sample. To implement these filter recursions, first generate noisy output measurements. Use the process noise w and measurement noise v generated previously. Implement the time-varying filter with a for loop. Compare the true and estimated output graphically. The first plot shows the true response y (dashed line) and the filtered response ye (solid line). The second plot compares the measurement error (dash-dot) with the estimation error (solid). The time-varying filter also estimates the covariance errcov of the estimation error y-ye at each sample. Plot it to see if your filter reached steady state (as you expect with stationary input noise). 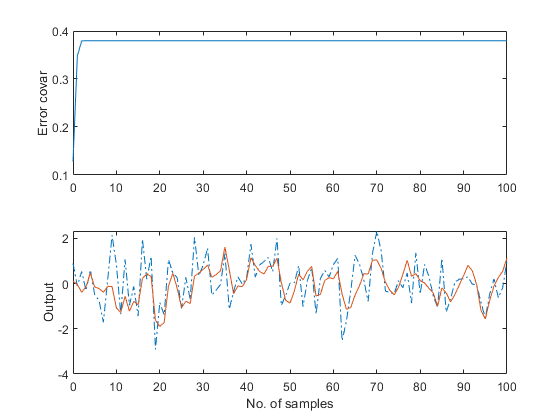 From this covariance plot, you can see that the output covariance did indeed reach a steady state in about five samples. From then on, your time-varying filter has the same performance as the steady-state version. This value is smaller than the theoretical value errcov and close to the value obtained for the steady-state design. Finally, note that the final value M[n] and the steady-state value M of the innovation gain matrix coincide. Grimble, M.J., Robust Industrial Control: Optimal Design Approach for Polynomial Systems, Prentice Hall, 1994, p. 261 and pp. 443-456.